Your relationship with the villagers is based on your Friendship Point (FP) value. The more friendship you have, the easier it is to trigger friend events and win festivals when those villagers are assigned as your teammates. You'll also need a very high level of friendship with your chosen sweetheart to get married. Your farm animals, pets, and wild animals also have their own friendship levels. Another benefit to having a good relationship is you can eat lunch meals with them. You'll need at least 5000 FP with a villager or 10,000 FP with a marriage candidate to be invited to eat when you talk to them. The lunch will last for one hour and will restore your stamina for free. Depending on what they are having for lunch, you might also get a status effect. On your birthday you will receive birthday gifts from the villagers when you talk to them if your FP with that person is 20,000 FP or higher. 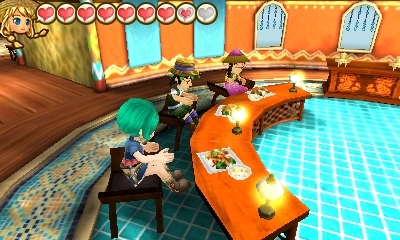 You'll also receive a birthday party from the villagers if your Town Link Rank is at C or higher. This party will rotate from town to town each year. To see your current friendship level with villagers, go to the bookshelf inside of your farm house and select your summary information. From there, select the Villager Info button to see a list of all the villagers you have met and what their current friendship status is with you. Each full heart next to the villager's name represents 10,000 Friendship Points. When you see zero filled-in hearts you know you have less than 5000 FP. A half heart indicates you have between 5000 FP and 10,000 FP, the first full heart means you're between 10,000 FP and 15,000 FP, and so on. With five hearts, you can have a maximum of 50,000 FP per villager until you have given your potential spouse a going-steady Pendant. That person will then have a chart of 10 hearts (90,000 FP) instead of five hearts. More information about friendship and Affection Points (AP) with marriage candidates can be found on the Getting Married page of the guide. Since the maximum FP is 50,000 FP, all candidates will stop at a light green flower color. Only the person you are going steady with will move on to the green, yellow, orange, pink, and red flower colors. The simplest ways to increase your relationships is to give gifts and attend festivals. Villagers have a variety of gifts that they appreciate, so not everyone will like the same gift. To give a gift, open the main menu (X Button), go into your bag, select the item you want to gift, and then choose the option to hold it in your hands. Then talk to the person to hand over the gift. Alternatively, you can make a shortcut by setting the item in your bag to the quick-select menu (Left Shoulder Button). You can give a gift to a villager once per day. Giving a gift on the person's birthday will give you a larger boost of FP. Festivals are another way to boost friendship. They take place so often that you might never need to give a gift to someone to raise their friendship to the maximum level. +1000 FP = Giving a person's special item (each villager has one of these), or giving a loved item that is a crop with both Gold and Giant qualities. On a birthday this becomes +3000 for both. +800 FP = These would be love-level crop gifts that have either Gold or Giant qualities, or a like-level crop gift that has both Gold and Giant qualities. This might not be an option for all villagers. On birthdays the FP becomes +2500 for love level and +2000 for like level. +500 FP = Giving a villager's love-level gift, or giving a like-level crop gift that has either Gold or Giant qualities. On birthdays the love-level gift becomes +2000 and the Gold/Giant like gift becomes +1500. +300 FP = This is like-level gifts. On the person's birthday this becomes +1000. +100 FP = Share a meal with the villagers. You'll earn this with each villager that you eat with. +50 FP = These are normal gifts that the person doesn't like or dislike. On birthdays this can become +500. You can also receive more FP by wrapping the gift in the person's preferred wrapping paper (+100), wrapping the gift in any other wrapping papper (+50), talking to the person daily (+100), wearing a clothing item the person likes (+100), completing a part-time job for a villager (+50), and showing the person a pet or wild animal they may like (+100). Participating and winning festivals can earn you between +50 FP and +2000 FP. Sending letters through the Postio in Westown can also increase friendship depending on the stationary you select for the letter. Villagers have their favorite paper that will give you a higher boost of FP compared to using ho-hum boring paper. This FP increase will be between +15 and +400 FP. Another way to increase friendship is by eating something that will give you the Friend Boost status. This effect will give you a 120% bonus for anything that you personally do to increase friendship as long as the status effect is on your character. For example, giving a love level +800 FP gift will earn you +960 FP. There are also three Farm Circle combinations that will naturally give you +50 FP with the villagers every day depending on which combo you trigger. 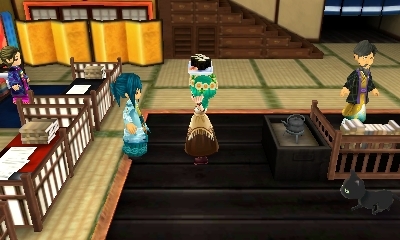 There is an object combination for Westown, Tsuyukusa, and Lulukoko. Placing all of the items on your farm will trigger the effect. Friendship can also be decreased. You'll lose -1000 FP if you give the villager their most hated, horrible gift item. You can lose -500 FP for giving a gift they hate, and -300 FP for giving a gift they simply dislike. Littering is included in this game, so avoid throwing items into the water. Doing so will decrease your friendship with ALL of a town's villagers by -2000 FP depending on the area where you tossed your junk into their waterways. If you throw something into the pond at the Crossroads that joins the three villages you will lose -2000 with every villager and not just town-specific villagers. Showing the going-steady Pendant or the marriage proposal item to another candidate when you have a boyfriend or girlfriend will earn you -2000 FP for every time you show the item to someone else. That item is meant for your beloved only!